Happy Thursday, friends! I'm back today with a new layout for the Hip Kit Club featuring the 2018 October Hip Kits. 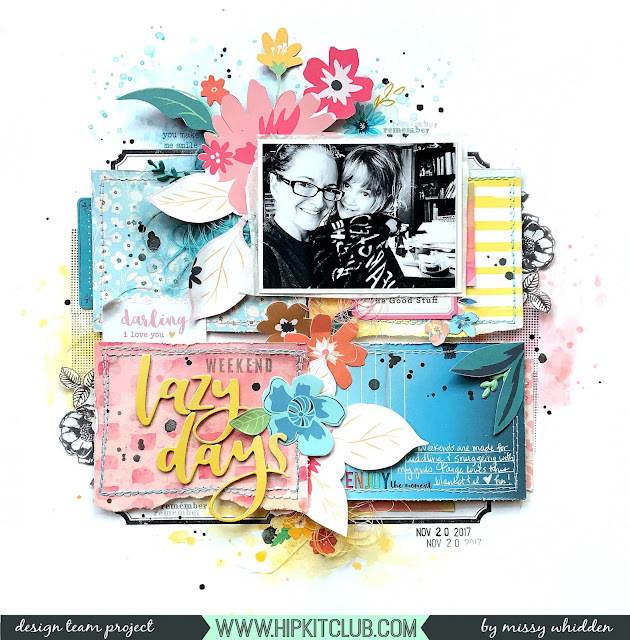 I focused on a grid design and the Heidi Swapp Stamps from the Project Life Kit. I started off by stamping some of the flowers on a sheet of vellum. I fussy cut them out and put them aside to use them as embellishments later. I decided to create a grid design by using some patterned papers and a Project Life card. I cut the papers to 3×4, which is the same size as my photo. I used white cardstock as my background and applied clear gesso around the edges of the cards. I used the label stamp to create some detail around the papers before adding some of the Shimmerz from the Color Kit. I fussy cut some flowers from one of the Paige Evans Whimsical papers from the Main Kit and layered them in between the bottom paper and the Project Life card. I added more flowers from the Whimsical Ephemera Die Cuts as well as some of the Rub-Ons and Sticker Book stickers. I wanted to add more detail around the papers, so I machine stitched around the edges. I fussy cut a few more bits from the Whimsical collection to add in, and I tucked in the stamped Heidi Swapp flowers along the edges here. Here you can also see that I stamped the dotted square on the background for some extra detail. I used some of the One Canoe Two Thickers for my title, and I love how that yellow pops against that pink papers. Here on the background I used the Shimmerz Sunflower. I did add some adhesive foam under the papers to create some dimension. I wanted to add some color variation to the papers, so I smudged on some white gesso and then painted on some Shimmerz. For this blue color, I mixed the Ride the Tide from the Color Kit with Oakie Bear Blue from the August Color Kit. I just painted it on with a brush and then added black splatters at the very end. I added another Whimsical Rub-On here at the top as well as another Heidi Swapp Stamp. I used a white gel pen here to write my journaling on top of the Project Life card.